Originally part of the Black Gold multi-sport set that was made into a football-only release, 2016-17 Panini Black Gold Collegiate Basketball is a standalone product with an NCAA focus. Each hobby box includes at least two autographs and two memorabilia cards. 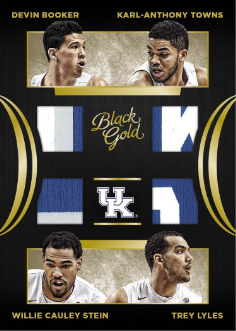 The base set covers the recent and distant past of college basketball on the typical Black Gold design. Limited parallels are numbered to 99 or less and include one-of-one Printing Plates. Premium content in 2016-17 Panini Black Gold Collegiate Basketball, numbered to 199 or less, includes two or three autographs in each box, with two being hard-signed. These signed cards are led by Autograph Jersey inserts with a jumbo relic and gold ink signature, while Black Gold Autograph contains on-card gold ink. 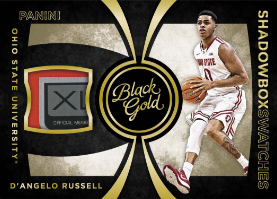 Perhaps most intriguing for basketball rookie collectors, Black Gold Collegiate offers the first on-card autographs from the 2016 NBA Draft class. In addition, 2016-17 Panini Black Gold Collegiate Basketball relics average two per box. The choices come as Golden Opportunity, Shadowbox Swatches and Quad Materials, which includes four different players on the same card. Also dropping two per box are the Collegiate or Rated Rookie Manufactured Metal Logo cards. 2016 SKAL LABISSIERE #15 25 BLACK GOLD COLLEGIATE ROOKIE ON-CARD AUTO MINT! 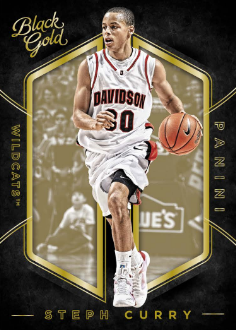 Shop for available 2016-17 Panini Black Gold Collegiate Basketball cards on eBay. released 10/19 and still no checklist ? whats with this Panini outfit ? michael youngman � It seems very odd that it has been this long and there is still no checklist.